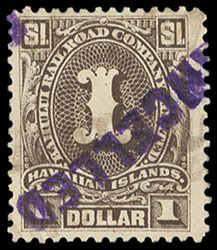 Hawaii, Kahului Railroad, 1894, 6¢ & 18¢, black "H.I." 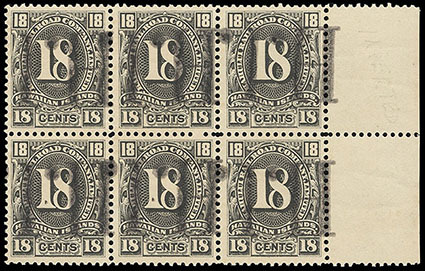 overprints, includes 6¢ left margin block of six and a 18¢ right margin block of six with inverted overprint, without gum, some light bends not creasing, Very Fine. I.D.C. No. KR2XH, KR4XH-IO Estimate $500 - 750. Hawaii, Kahului Railroad, 1894, 50¢ purple, red crayon and light purple straight line "Cancelled" cancels, choice centering and bold color, tiny perf thin at top, otherwise Extremely Fine. Meyer-Harris No. 155 Estimate $150 - 200. Hawaii, Kahului Railroad, 1894, $1 gray brown, bold purple straight line "Cancelled" handstamp cancel, rich color, Very Fine. Meyer-Harris No. 156 Estimate $150 - 200. 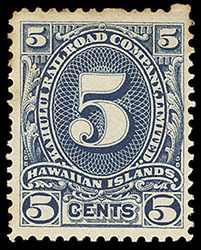 Hawaii, Kahului Railroad, 1894, 5¢ blue, o.g., never hinged, choice centering, some light perf toning, still Very Fine, this may well be the only known never hinged example of the 5¢ Kahului Railroad in existence. Meyer-Harris No. 151 Estimate $300 - 400. 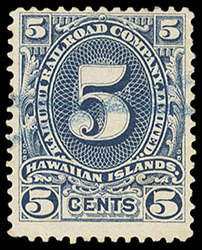 Hawaii, Kahului Railroad, 1894, 5¢ blue, blue unobtrusive crayon cancel, rich bright color, F.-V.F. Meyer-Harris No. 151 Estimate $250 - 350. 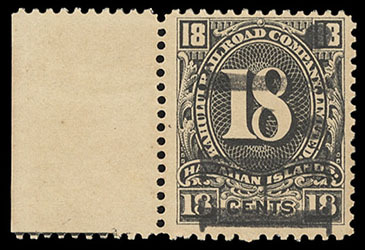 Hawaii, Kahului Railroad, 1894, 6¢ & 18¢ issues, black "H.I." overprint sideways, single of each, without gum, Very Fine, the rarest of the overprints. Meyer-Harris No. 152, 154 Estimate $200 - 300. 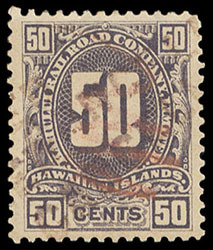 Hawaii, Kahului Railroad, 1894, 6¢ & 18¢ issues, complete sheets of 50, without gum, fresh and Very Fine (no photo). Meyer-Harris No. 152, 154 Estimate $400 - 600. 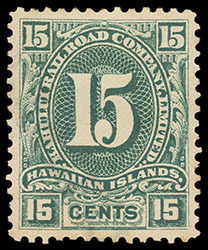 Hawaii, Kahului Railroad, 1894, 15¢ green, without gum as usual, beautifully centered amid evenly balanced margins, rich bold color, an Extremely Fine gem. Meyer-Harris No. 153 Estimate $1,000 - 1,500. 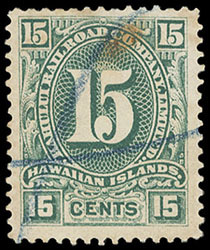 ONE OF THE FINEST MINT EXAMPLES OF THE 15¢ KAHULUI RAILROAD ISSUE. It is theorized that fewer than 100 of the 15¢ A.B.N.Co. Kahului Railroad issue have survived. Hawaii, Kahului Railroad, 1894, 15¢ green, blue crayon cancel, rich deep color, F.-V.F., the rarest of the Kahului Railroad issues. 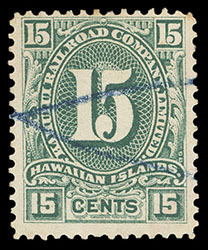 Hawaii, Kahului Railroad, 1894, 15¢ green, Schmidt printing, blue crayon cancel, strong color, small tone spot at top, F.-V.F. appearance, a rare railroad issue. Meyer-Harris No. 159 Estimate $300 - 400.